Huntingdon Christmas Market is sure to get you in the festive spirit! The market will feature festive food and drink including mulled wine and spiced cider, live music as well as children's entertainment and a variety of stalls selling seasonal crafts, gifts and produce – perfect for those Christmas gifts, hamper ideas and stocking fillers. 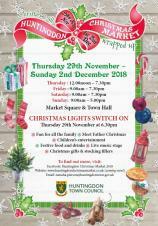 The Christmas Lights Switch on at the Market Square in Huntingdon will be sure to put you in the festive spirit. There will be fun for all the family. Joy, famed for her brilliant solo performances with the Britten Sinfonia, will be joined by colleague, Caroline Dearnley, soloist and leader of the cellos in the same orchestra and pianist John Lenehan who frequently partners many iconic instrumentalists both in the UK and abroad. 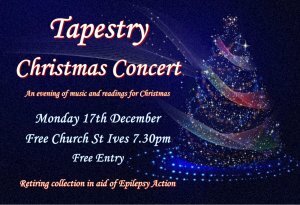 Their programme will include trios by Brahms and Beethoven. Buckden Handbell Ringers: EngAGE in the Afternoon at Huntingdon Library. The event is free, from 1.30pm - 3pm. A meeting of the Finance Budget Sub Committee. This meeting was private and confidential. 1940s Charity Dance Night, all profits to Marie Curie. Get 'in the mood' for Christmas. 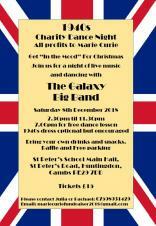 Join us for a night of live music and dancing with The Galaxy Big Band on Saturday 8th December 2018, 7.30pm until 11.30pm. Please arrive at 7.00pm if you would like to participate in a free dance lesson. 1940s dress optional but encouraged. A meeting of the Finance Sub Committee. This meeting was private and confidential. A meeting of the Town Council. BRoW4 is a non-profit fundraising group, made up entirely of volunteers. Between the volunteers BRow4 organise three events a year to raise money and awareness for non-government or National Lottery funded charities. One of the events is a New Year's Dog Walk to raise awareness and money for the Dogs Trust, Canine Partners, Medical Detection Dogs and Therapy Dogs Nationwide. The event will take place on Sunday 6th January 2019 at Hinchingbrooke Country Park from 10.00am. HTML5 validated. WCAG compliant. Page generated in 0.1378 seconds.